Fair or Foul results are in!! Should the Boston Red Sox re-sign Curt Schilling? With an overwhelming 88% of the vote, thefoulline.com readers have decided that this should be Curt Schilling’s last season in Boston. I have mixed feelings about this. Part of me says get rid of him. He is a self-involved blow-hard. His best years are behind him, and he seems to be more interested in his video game company. He makes $13 million per season that could be used to give the Sox more flexibility in the offseason. The other part of me says keep him. He has really improved over his last few starts, and when you think of big game pitchers in Major league baseball history, Schilling is on the short list. Three days ago, I would have said let him go, but with the recent developments with Clay Buchholz and Tim Wakefield having back problems, if Schilling would sign a one-year deal in the $13 million neighborhood, I would keep him. Maybe it’s because I have a soft spot in my heart for bloggers. With the Boston Red Sox already clinching the AL East title and home field advantage throughout the playoffs, I thought I would write about what I feel is the worst thing about American baseball: the Jan Brady of the major leagues, National League baseball. The NL for me is really hard to watch. I’m sure it has something to do with growing up in New England and being exposed to AL baseball before there was interleague play. There were very few National League games on TV in New England. After watching some of the junior varsity baseball that’s being played in NL cities, I am thankful for this. Here is a fact: Nobody wants to see pitchers stand at the plate and either watch pitches go past them without ever letting the bat leave their shoulder or, even worse, think they can hit and end up flailing around with the bat. Pitchers are an easy four outs a game, every game. It’s tough to watch. People can say what they want about the designated hitter. That it’s unfair to have a guy that only hits. That the DH isn’t a real ballplayer. That you should have to field and throw. But when guys like David Ortiz or Frank Thomas come to the plate, no one changes the channel. Can you say the same when Pedro Martinez is up? It’s no coincidence that the American League has the better record in 8 of the 11 years of interleague play and has 10 of the last 11 All Star games. It should also be noted that this season, teams with a .528 winning percentage are making the playoffs in the NL. This same team in the AL would be watching the playoffs from their couches. NL fans state that there is more strategy in National League games, with double switches and small ball. The AL could implement these strategies. But why? They already have superior pitching, better hitting, and more exciting games. With another World Series coming to the American League this season, I wouldn’t change a thing. The Boston Red Sox are the American League East champions for the first time since 1995. I’m pretty excited. It’s great to see Boston stick it to New York once again. The playoffs start next week. Let’s check out why it’s important that Boston won the East. Most importantly: bragging rights over the Yankees. So close, but yet so far, Yankee fans. Another gag job by Mariano Rivera in the 9th inning against the woeful Baltimore Orioles was a thing of beauty. This guy has not been himself all year. Let’s hope this crushes his confidence going into the post season. Home field advantage is nice. The Green Monster, Fenway Franks, sleeping in your own bed. Not to mention Boston is 50-29 at home this year which is a big plus. Boston gets to play the Angels. This is the match-up I was hoping for. Boston should beat up on the Angels pretty easily, leaving Cleveland to manhandle the Yankees at Jacobs Field. Did I mention that Boston now has bragging rights once again over the Yankees? The Red Sox have not taken anything for granted this season. They have busted their asses all year. They have their eyes on the prize. I don’t see them letting up. The Yankees were hoping to clinch the wild card last night. Unfortunately, Boston and Tampa Bay didn’t cooperate, so I guess we’ll have to play a few more. The Yankees were up partying early into Thursday morning after their epic playoff-clinching win. It was so bad for New York, they elected not to show up in Tampa for batting practice. To reinforce that the Yankees were content to just make the playoffs, Joe Torre sat A-Rod, Jeter, Abreu, and Posada and replaced them with big game players Wilson Betemit, Alberto Gonzales (the crappy backup shortstop, not the disgraced Attorney General), Bronson Sardinha, and Jose Molina. Can you imagine buying tickets to a Major League baseball game and finding this lineup? Why didn’t New York just trot out their AAA team from Scranton Wilkes-Barre? Boston, on the other hand, decided to show some pride and play their everyday lineup in hopes to win the AL East. Although the spirit was willing, the Red Sox just didn’t have it last night. Beckett looked un-Cy Young-like, leaving his fastball in the middle of the plate and overthrowing the ball. Mike Lowell hit into two double plays, killing two Boston rallies. And Boston left 12 guys on base. I’m giving Beckett and Lowell a free pass on last night’s loss. They have been the two best Red Sox players this year and are entitled to one bad game. Let’s hope that it’s now out of their systems, and they will go back to carrying this team on the way to the World Series. The Yankees play in Baltimore tonight, if they weren’t at Mons Venus too late last night celebrating another win against the AL East cellar dwellers. I hate the New York Yankees. I’ve stated this countless times on this blog. I will never change this opinion. After last night’s game, the Yankees could have gone to the nearest Tampa Bay orphanage and handed out milk and cookies to the kids and I would still despise them. Instead, New York decided to act like a bunch of idiots. After beating the Devil Rays and limping into the playoffs, the Yankees partied like it was 1999. For a storied franchise, winners of 26 World Series titles, to spray champagne and cry like a bunch of girls was pathetic. Was their only goal this season to back into the playoffs? Please tell me Joe Torre has more planned for this team. I know of another AL East team that had clinched a playoff spot while playing Tampa recently. They celebrated by toasting each other with a glass of champagne. They know that this is not the end of the road, and that there will be more celebrating before this season is over. I’m tired of Yankee fans spouting off about how New York has 26 rings and is the greatest franchise in sports. It’s easy to say you’re the classiest. I think it’s time for the Yankees to start acting like it. I really like the look of the Boston Red Sox lineup right now. After 158 games of the season, is it possible that Boston has finally found the right combination to put out on the field? Let’s look at the lineup from the last two nights. Dustin Pedroia has been leading off. Although not your prototypical lead-off batter, this guy has a great eye and consistently gets on base. Pedroia is batting .317 and has only struck out 42 times this season. Even though I could beat him in a foot race, I would leave him hitting first. Which brings us to Manny in the 2 hole. Everyone has seen Manny’s power numbers drop off this season. So instead of forcing the issue and possibly straining his oblique again, let him continue his recent stretch as a singles hitter. These last two games he looks like he could hit line drives all day long. Keeping Big Papi and Mike Lowell hitting 3rd and 4th is a no-brainer. These guys are each hitting .325 and have combined for 230 RBIs. J.D. Drew is batting 5th and has been hitting pretty well lately. I would flip-flop Jason Varitek and Kevin Youkilis. Youk is still hurting and has not been the same hitter since coming back from his wrist injury. Crisp and Ellsbury followed by Julio Lugo hitting 9th would round it up. This lineup changes the look of the Red Sox just a little but has proven to be productive after getting 17 hits last night and putting up 7 and 11 runs the past two games. Let’s hope this continues over the final 4 games of the regular season and into the playoffs. Oh, Manny. You came and you gave without taking, and I pushed you away. Oh, Manny. 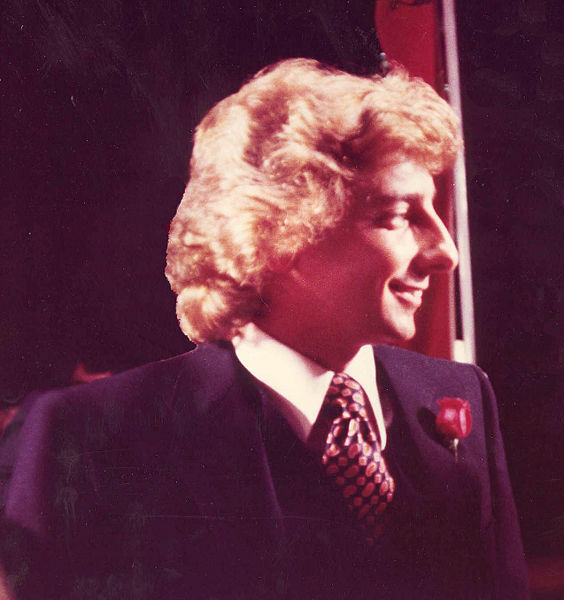 O.K., I promise that will be the last Barry Manilow reference that you’ll ever see on this blog. You have to understand, my mom was a huge Manilow fan and would play the hell out of his 8-tracks. It’s burned in my brain. I’m not proud of it. Anyhow, Manny was back in the lineup last night, and it was good to have him back. I’ve said a lot of negative things about Manny this season. I still think he quit on his team for 25 games. I still think that 2008 is his last year in Boston, and I still think he is a mental midget that looks like the Predator. With that being said, Manny does add a lot to the batting order. Just for his reputation alone, any young pitcher throwing to Man-Ram is going to be sweating bullets. And he looked pretty good last night. He hit a nice line drive in the first inning and drew a walk later in the game before being removed. 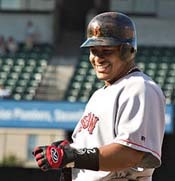 Manny is always going to be Manny, but if he’s the Manny of the 2004 playoffs, I’ll deal with it. Other notables from last night’s game: Schilling was solid again for 6 innings. J.D. Drew was 3 for 4 and drew a bases-loaded walk. Ellsbury added 2 more RBIs, and Papi added some insurance in the 8th inning. Also, even though he went 0 for 2 on the night, it was really good to see Youkilis back in the lineup. How great was it to see the D’Rays battle back from a 5-0 deficit to beat the Yankees 7-6 in 10 innings? New York has played a lot of extra inning games lately. Let’s hope their tank is empty when the playoffs roll around. The Yankees may be singing “Looks Like We Made It” now, but at this rate they’ll be watching the playoffs on TV. Do they show MLB at the Copacabana? If Boston holds on and wins the AL East, they will face the Cleveland Indians. There is good and bad news with this scenario. First of all, the Indians only claim to be from one city, which reduces confusion. Secondly, New York would end up playing the Angels, which could be really interesting. The Yankees don’t match up well with the Angels. Here is an interesting fact: the Angels are the only team in the major leagues to have a winning record against the Yankees since Joe Torre became New York’s manager in 1996. Not to mention, it would be great to see the Yankees bust their asses to get into the playoffs only to lose in the first round. Now the bad news. There are two things that scare me in a 5-game series against Cleveland. Both of these guys are legitimate #1 starters. They both have 18 wins and sub-3.20 ERAs. They challenge hitters and are fearless. Add Grady Sizemore, Travis Hafner, and Casey Blake, and you’ll see the Indians are for real. What Boston has going for them is they’ve been in the playoffs before and have big-game players in Big Papi, Josh Beckett and Curt Schilling. The Indians’ lineup is young and untested. The playoffs are a whole new ball game. Teams that are great in the regular season sometimes crumble on the big stage. This could be a big opportunity for them to showcase their talent. As a Red Sox fan, which scenario would you prefer? The Red Sox have made the playoffs. Yippee. This is the extent of my excitement. Everyone knew they were going to make the playoffs. I really want to see them win the AL East for the first time since 1995. But would it be better if Boston came in second and was the wild card? The way I understand it, if Boston wins the division, they play the Cleveland Indians in the first round. If Boston is the wild card, they would play the San Diego Angels of Oakland, or whatever their stupid name is these days. Of these two scenarios, I think the Sox match up better with the Angels, even if the Angels have home field advantage. Boston always plays well against these guys. Remember the 2004 playoffs, when the Red Sox dominated them? Or even this year, when the Sox were on the verge of a series sweep until they put in Eric Gagne. The Angels have a good team that plays hard, steals bases, and is really good defensively. They have superstars in Vlad Guerrero and Garret Anderson, and quality starting pitching. But I think they all shrink in the clutch. Their superstars don’t step up and carry their team, and their pitching has the tendency to look ordinary. I know they’ve won their division three out of the last four years and won the World Series in 2002, but if they meet the Sox in the playoffs, they are going to get their butts kicked again. Next up: The potential Red Sox/Cleveland Indians matchup. Will Curt Schilling still be playing for the Red Sox in 2008? Fair: Curt Schilling has been better than his 8-8 record indicates. He has a 3.97 ERA and has pitched pretty well during his last three starts. Not to mention, with the playoffs right around the corner, few pitchers pitch as well as Schilling when it matters. Let’s not forget 2004 and the bloody sock. Foul: Curt Schilling is past his prime. He came into spring training out of shape and it really affected his performance early in the season, even leading to a stint on the DL. Maybe if he spent more time working out instead of working on his video game company it would justify a new contract. Put his $13 million to a better use.